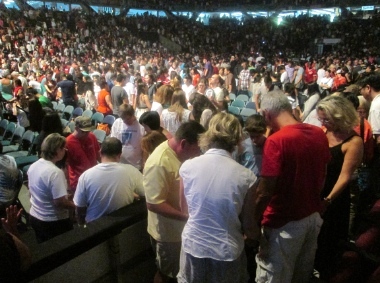 The Pacific Coliseum became a house of prayer during Voices Together. Emerging from the Pacific Coliseum and looking towards the North Shore mountains hazy in the late evening sun, I felt thankful to be alive in a city where God is so clearly at work. I had just spent three hours on the evening of Canada Day at Voices Together. 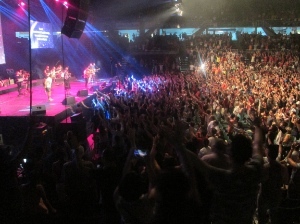 Thousands of Christians (one guesstimate from the stage was 10,000) from all denominations, from all over Metro Vancouver, worshipped and prayed together. There were several highlights, but as I am writing this late on the same evening – so that I can include this story in my weekly update – I will restrict myself to brief accounts of a few elements that struck me as particularly memorable. 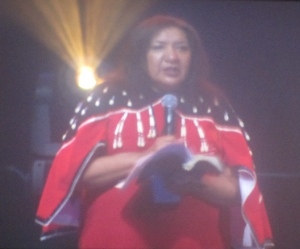 Lynda Prince said First Nations people have “released forgiveness” to the nation of Canada. Later, setting up a time of prayer for First Nations people, she pointed out that 2014 Stats Can figures confirm that Aboriginal people are the poorest in Canada because of government policies. She asked the ‘congregation’ to pray that those policies will change so her people can share in the nation’s prosperity. She also asked for prayer for the high rate of suicide on reserves. 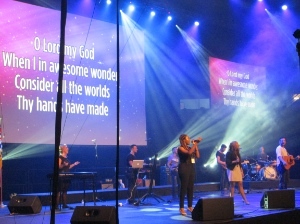 Worship Central led several songs, including How Great Thou Art. One could not help but think of the beauty surrounding the Coliseum, and the good fortune enjoyed by the nation whose birthday we were celebrating – but also, and particularly, about the source of our good fortune. 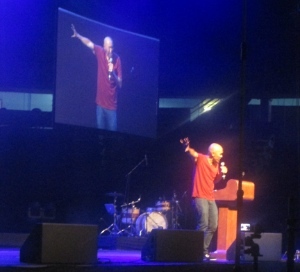 Francis Chan was passionate about the significance of unity for the church. Francis Chan spoke for about 20 minutes and was very well received. His talk was passionate, reverent and plain-spoken. He began by saying, “We’re real good at rallies like this, but where is the action?” His main challenge was to take God seriously – to remember that he is watching us at every moment and to take his word at face value. Chan, a popular author and pastor from the San Francisco area, recounted a story of meeting a man coming out of a halfway house, just out of prison. It turned out he, his wife and three children had nowhere to stay. Chan felt nervous about the man – large and tattooed – but he and his wife (and their seven children!) offered the family a place to stay. That man is now a pastor, in ministry with Chan. “The church was supposed to be known for its love,” Chan said. 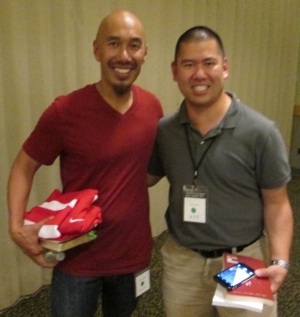 Francis Chan (left) with Clayton Imoo, Director of the Office of Youth and Young Adult Ministry the Roman Catholic Archdiocese of Vancouver, just before Voices Together. Young leaders were prayed over by senior city leaders. We spent about 20 minutes praying in small groups, for Canada, for First Nations, for the city. That was a good opportunity to interact with people we didn’t know. The Faith Chinese North American Baptist Church Choir did a great job on a couple of hymns. Two dance groups livened things up – quite different, both talented. 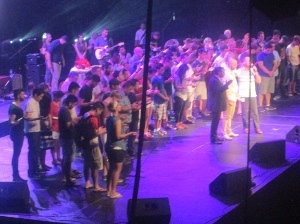 Youth leaders were called up on stage to be recognized and prayed over by senior church leaders. The Chapel Band ended off with a bang; young people were called to the front and danced to the music. ← Around Town: MVA Rally, Remnant Future, Baptists coming and going . . . Yes, Flyn, it was a remarkable evening. I do believe that God was glorified through a well-thought-out Spirit-filled event. Great, blessed time of worship & praise. Francis Chan’s message was challenging & relevant to be more Christian in relating to my neighbors whoever they may be. Wonderful atmosphere of unity, friendliness & love in Jesus. Thanks to all the organizers for holding this Voices Together event. Only negative comment which several people mentioned – turn down the decibel volume of the drums which reverberated even in my chest. Way too loud even with earplugs! I was there as well and agree with your comment, “I felt thankful to be alive in a city where God is so clearly at work.” Indeed. What bothers me about this sentiment is that it usually is expressed in contexts of Christian activity. No one denies that He is at work at other times and occasions as well, but it is seldom expressed. De facto the sentiment is basically restricted in its import to Christian activity. It’s not a lie, but we need to be much more aware of the entire scope of God’s work throughout our city and country in spite of the strenuous effort of His opponent as well. The way we tend to resort to this sentiment almost turns it into a lie. At least, it can easily give the wrong impression of a restricted God. Let’s consciously celebrate His activity in every sphere of His creation, even where His name may not be honoured. I can see your point. However, I was thinking not primarily of the Voices Together event, but also of the God’s work out in the city. That’s one reason I highlighted ‘How Great Thou Art’ – a hymn that stresses God’s sovereignty over all of creation. Lynda Prince’s comments also show how God is active in the Aboriginal community, largely outside of the church. And one of the other stories I sent out this week is about the Living Wage Rally coming up July 8 – Christians are involved, but so are many others. Having said all that, I’m fine with simply celebrating Voices Together as an expression of Christian unity. As Francis Chan said, that ‘in-house’ activity – and others of a similar nature – will draw many to Christ. Those who have ears to hear and eyes to see will learn to appreciate how broad and culture-impacting a reality that can be. Congratulations to the Church in Vancouver for such a demonstration of unity. I am challenged by your summary of Francis Chan’s comments about living it out the other 364 days of the year.